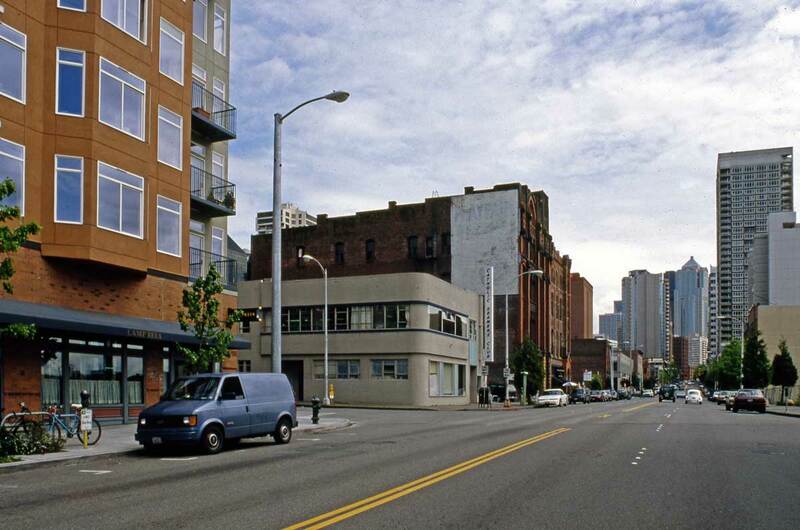 NOW: In 1910 Hotel Grace took the place of the attached storefronts furthest to the south (on the left) on the “Rowe Block.” Soon renamed the Apex Hotel it served the single men who required “cheap digs” in the often-depressed Belltown neighborhood. 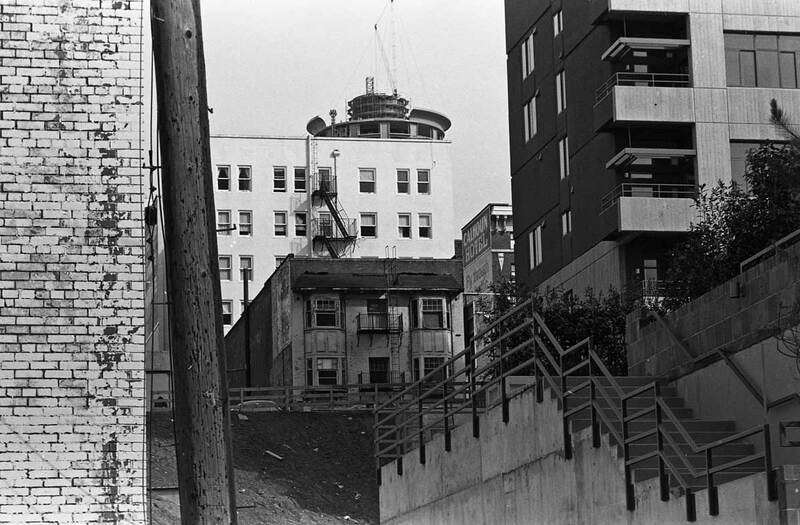 Later the vacant hotel’s two top floors were made over into a “limited-equity housing coop” named the Apex Belltown Co-op, which first opened in 1984 with the author one of its first residents. Rowe’s two frame buildings nearest the corner – and at it – were still in service well in the nineteen teens. They were replaced with a vacant lot, until the recent addition, front-center in Jean’s repeat. 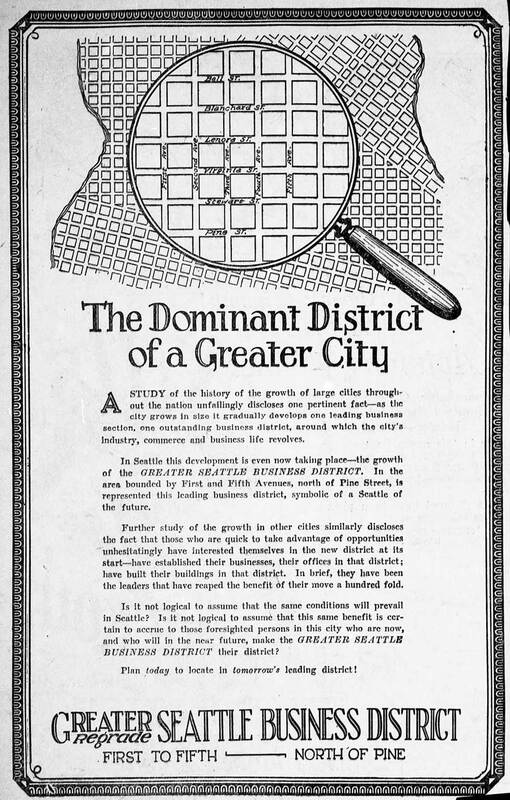 A detail from a 1917 birdseye of the “new retail district” and also of part of Belltown, includes, center-bottom, the southwest corner of First Ave. and Bell Street, showing the unique box-window on hanging at the second window above the sidewalk at the corner. Pacific’s “now and then” is but one of many such heritage features that have appeared in this paper and others through the years. For instance, The Times first used the subject shown here on Sunday March 14, 1934 for its then popular pictorial series titled “Way Back When.” The photo was submitted by Times reader Mrs. Loretta Wakefield and was but one of ten historical scenes sharing a full page. We assume that the photo captions were also first drafted by those who first entrusted the photographs. And for this each contributor received from The Times the thankful prize of one dollar. The caption for this subject concentrates on its line up of carriages, teams, pedestrians, employees and clapboard storefronts posing and/or standing on the far southwest corner of First Ave. and Bell Street. It reads, “A buggy show during 1875 – Louis S. Rowe was the manufacturer whose carriage display enticed Seattleites sixty years ago.” Not quite. 1875 was the year that the 40-year old Lewis (not Louis) Solomon Rowe first arrived in Seattle to stay. 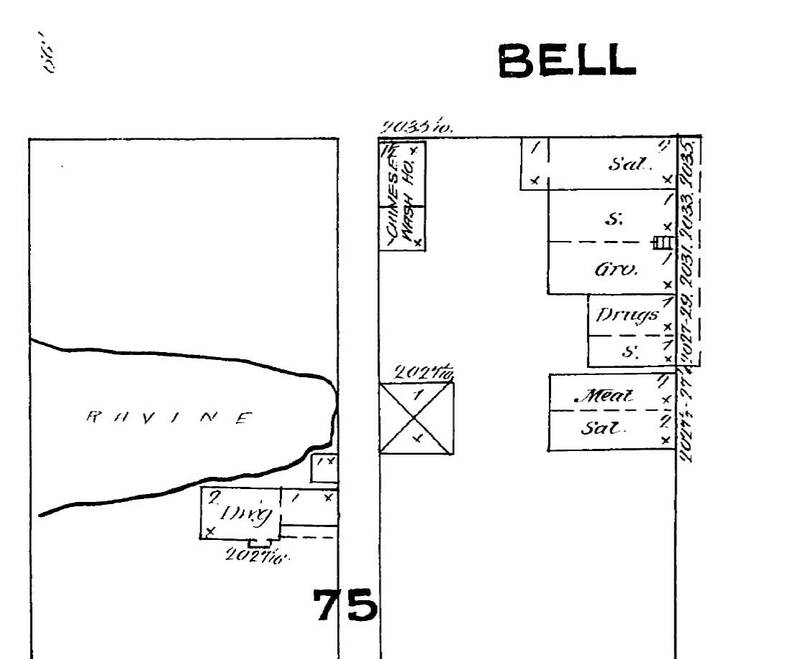 Our dear old stock map, the Baist from 1912, shows most of the corner southwest corner of Bell and First still in line with corner built-up by Rowe in the late 1880s. Hotel Grace is distinguished by a unique pink, which may be in part a gift of age. Since the yearly 1984 this hotel’s upper two floors have been home to the Apex Coop. Rowe’s way with carriages began in 1848 when as the youngest of nine children he left the family farm at the age of fourteen and bound himself for two years to a carriage maker in Bangor Maine. He was paid $30 dollars the first year. By 1861 Rowe was in San Francisco and still employed by a carriage manufacturer. However, by also running the shop and working by the piece he made $60 to $70 a week. With a some delving Ron Edge found Rowe’s grocery on Front Street (First Ave.), the location supplied for him by Henry Yesler. The structure on the far right horizon is Dr. Roots home and office at the southeast corner of First or Front and Lenora Ave on the western slope of Denny Hill, and so two blocks from Rowe’s next home. 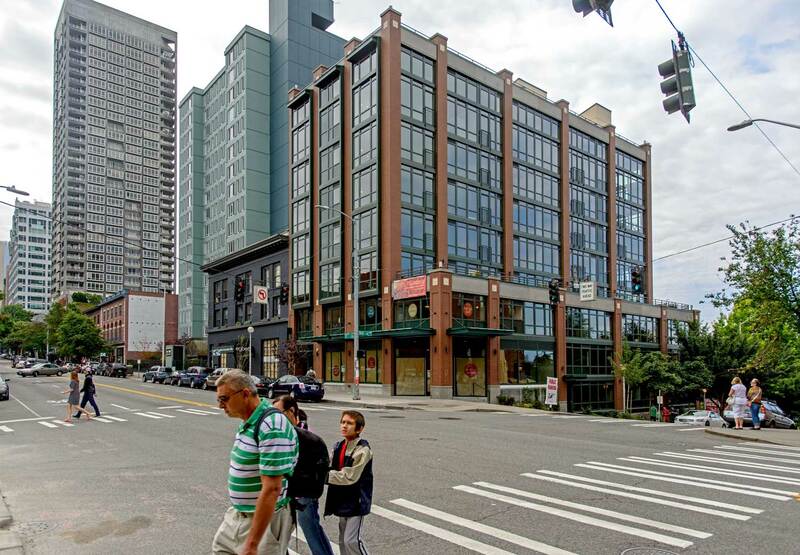 Next – and last – in Seattle Rowe first turned to selling groceries from a shop built for him by Henry Yesler on First Avenue at the foot of Cherry Street. With the cash got from cauliflower and candy sales, Rowe bought land and lots of it, including this southwest corner of First and Bell. Here in the mid 1880s he built his “Rowe’s Block” and soon started both selling and caring for carriages at his corner. 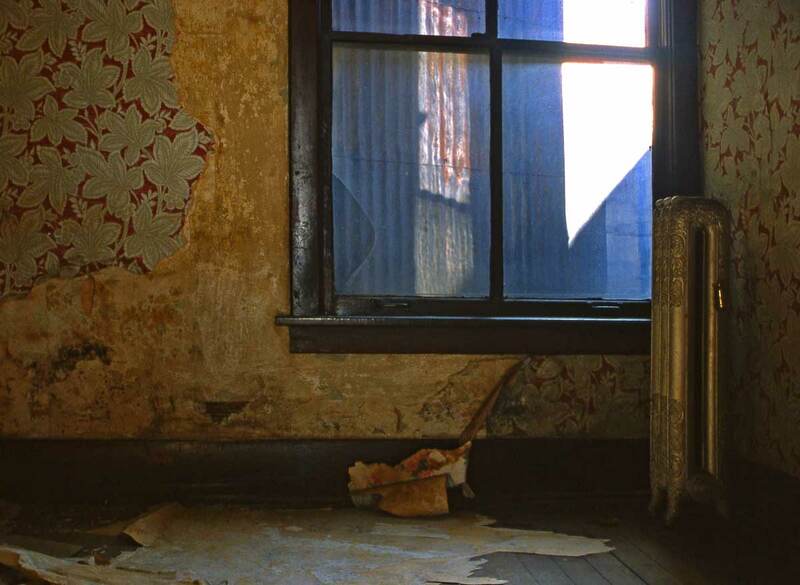 By the evidence of his neighbors – his renters included a drug store; the Watson and Higgens grocery; the Burns Barber Shop; and the Saginaw House, a small hotel – this photo of Rowe’s row was recorded late in 1888 or early in 1889. 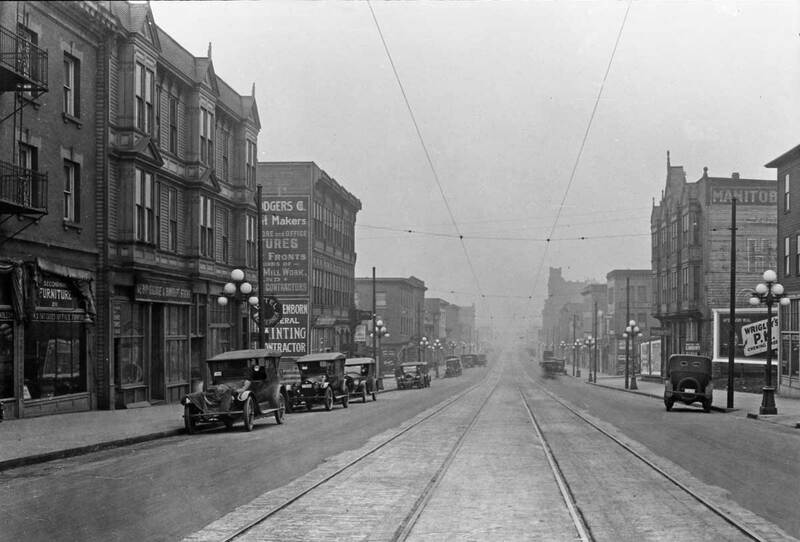 On March 30, 1889 electric trollies first took the place of horse cars on these tracks running through Belltown to Lower Queen Anne. Trolley wires do not as yet seem to be in evidence. Anything to add, Paul? We will begin with a few snapshots taken during the preparation of the Apex Coop in 1983-4 followed by few features from the neighbor as these late hours allow. My room in the APEX Hotel – how I found it. I have saved some of the wallpaper – the several layers of it, torn as ready-made collage. COOP labor: we saved on our bills by helping bring the old hotel up to snuff fine enough to pass inspection and allow us to move in. More coop labor. 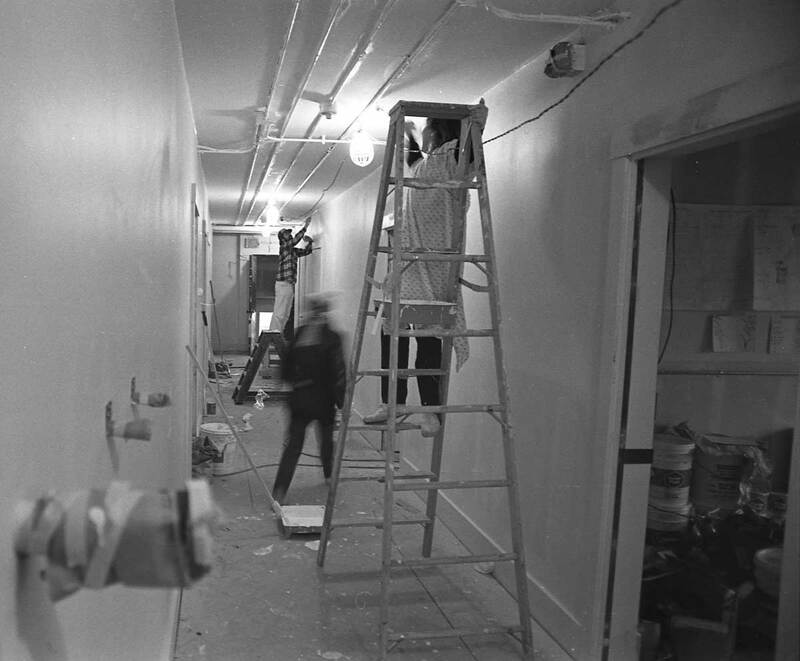 It has been 29 years since I took these snapshot of fellow members doing more trade-out work, and now I discover that the names I knew the last I looked at these negatives – years ago – I no longer remember. I do remember the more abiding qualities like tone of voice, sense of humor, and such. Up with Belltown – a map that magnifies the early and overall hopes of the Denny Regrade when it was fresh from digging. For many years I puzzled over this scene’s foreground. The distant part is familiar. Beacon Hill holds the horizon; below it protrudes the darker forms of what was then the central waterfront. It extends south from Yesler’s Wharf (center) to the King Street coal wharf, which reaches farthest west into Elliott Bay. Two tall ships are tied to either side and another (far right) holds just beyond it. The boardwalk, homes and fresh excavation are more difficult to place. The Museum of History and Industry print reads “Seattle from vicinity of First and Pine, ca. 1882.” The date is closer to circa 1884. Magnification reveals structures that were not completed until 1883 was itself completed. And this is surely not First and Pine, but more likely five blocks north at First and Bell. 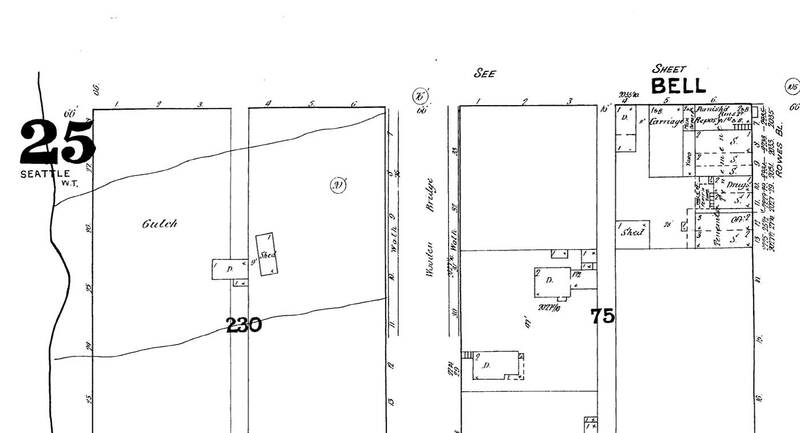 The 1884 birds-eye view of the city and the Sanborn real-estate map of the same year show a home at the southwest corner of Bell and Front (First Avenue) with a shape similar to the one here, far left. In both, a small extension is attached to the rear of the house. A detail from the 1884 birdseye of Seattle gives modest expression to the verdant habitat of the Belltown Ravine. It does not extend the ravine east to First Avenue (which the Ravine on its own did manage to reach). 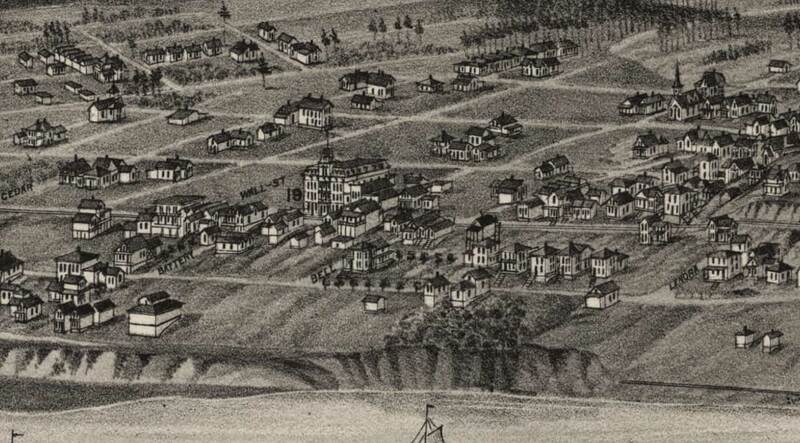 The birdseye also shows the row of structures at the northwest corner of Front (First) and Bell, which, we hope, the artist included to depict the homes showing in the principal subject, above. 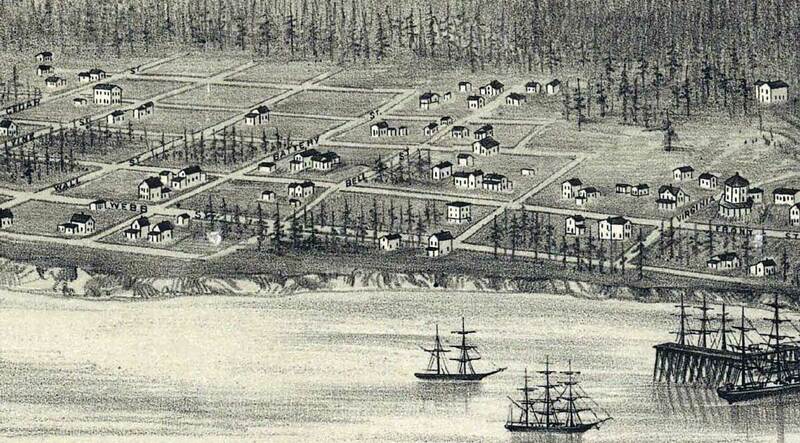 The same Belltown section of the waterfront as depicted by the artist of Seattle’s 1878 Birdseye, its first. 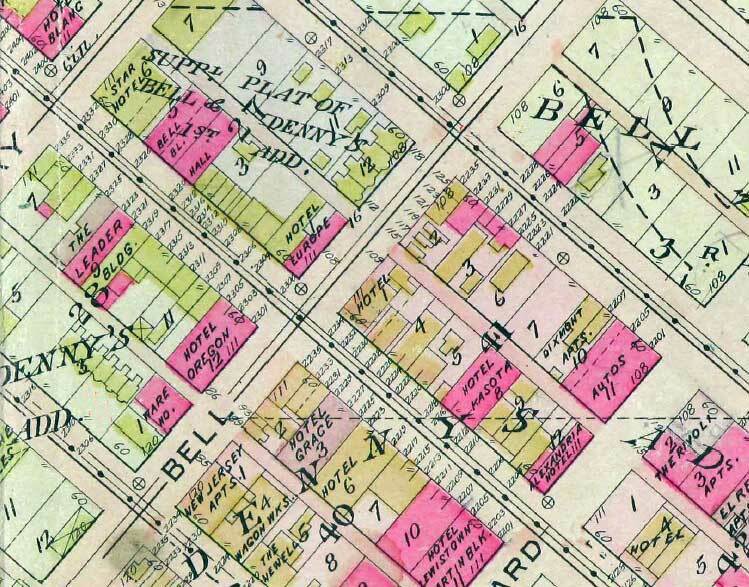 The 1884 Sanborn map – a detail showing the southwest corner of Bell and Front (First) and the Belltown Ravine too, although here its intrusion east of the waterfront is stopped at Western Avenue, when in 1883, at least, it still reach a short way east of First (Front) Avenue. In September 1884, the territory’s first street railway began its horse-car service as far north as Battery Street (less than a block behind the photographer, if my identification is correct). 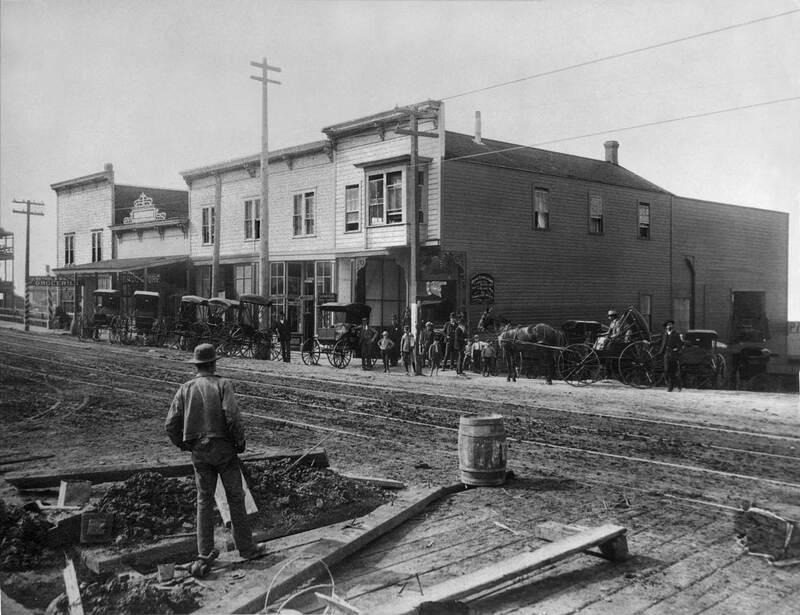 Although we cannot see the street beyond the boardwalk, far left, we can speculate that the fresh dirt spread across the foreground was placed during the first regrade of First Avenue, undertaken, in part, to give horses an easier grade reaching Belltown. 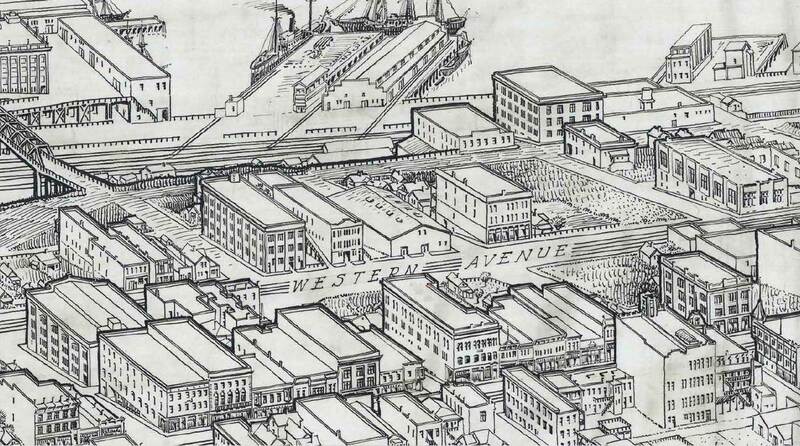 Topographical maps from as early as the 1870s show a “Belltown Ravine” extending from the waterfront to just beyond First Avenue – hence the bridge, far left (again, if I am correct.) This, then, is evidence of the first fill into a ravine now covered. 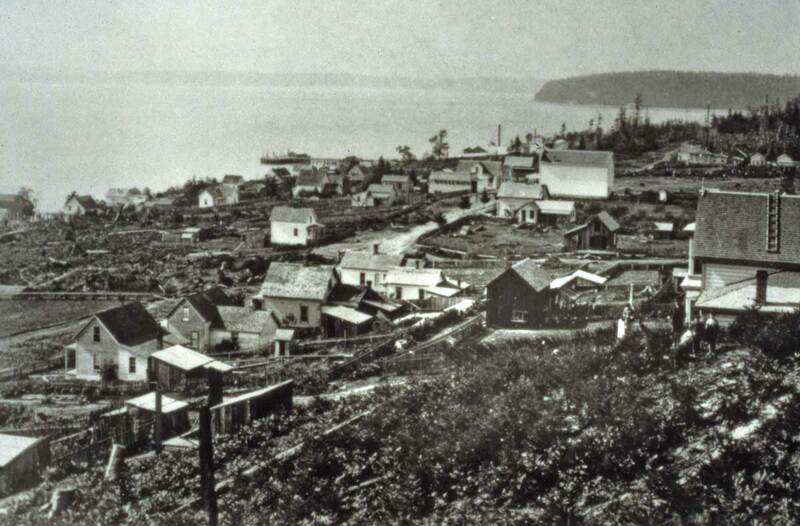 Watkin’s 1882 look into Belltown from the western slope of Denny Hill. The southwest corner of First (Front) and Bell, is far left. Finally, an 1882 view (above) by the visiting Californian Watkins, looks into Belltown from the west side of Denny Hill and shows a fence at the southwest corner of First and Bell that looks (to me with reserve) like the fence running nearly the width of this scene behind the freshly excavated dirt. 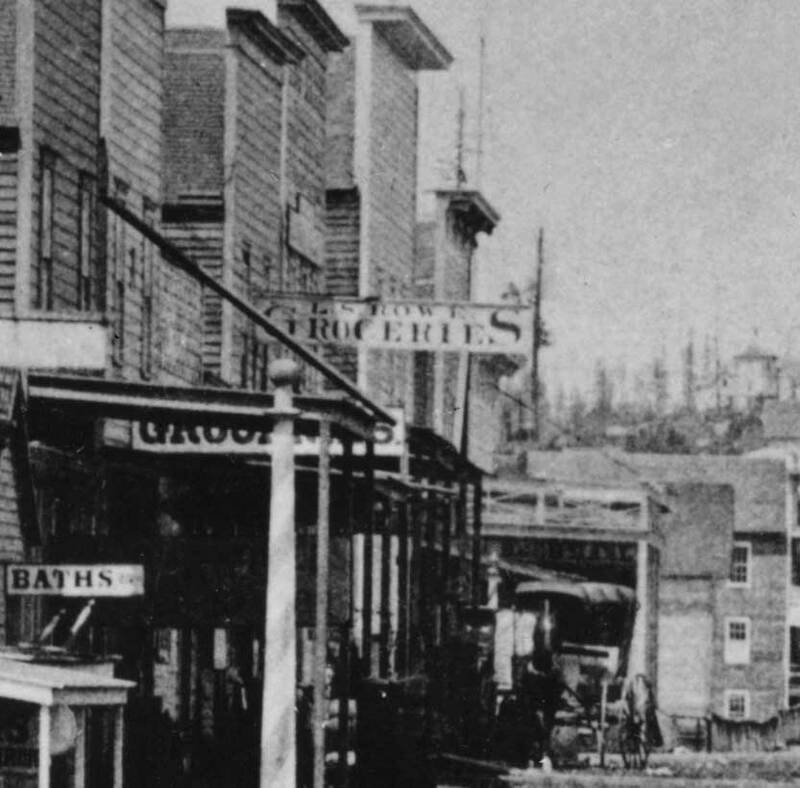 Belltown, circa 1887, looking north across Blanchard and Bell Streets to the towered Bell Hotel at the southeast corner of Front (First Ave.) and Battery Street. In 1883 the transcontinental Northern Pacific Railroad at last reached Portland and Puget Sound. Seattle, and the rest of the Northwest, had been yearning for this invasion. Arthur Denny and William Bell, two of the Midwestem farmers who years earlier had come to this wilderness to start a city, waited with subdivided real estate for the coming tide of settlers. Only 32 years after they landed at AIki Point, their city of close to 7,000 residents was the largest In the territory, and their contiguous claims were next in line for serious development. The border between their claims ran diagonally across Denny Hill. A view from the top looked south over Denny’s land toward the center of town. Turning around one looked north toward Belltown. Here, In November 1883, William Bell completed his namesake hotel: a four-story landmark with a showy mansard roof and central tower. The Bell family home facing Front (First Ave.) from its east side and two lots north of Bell Street. It was the 66-year-old pioneer’s last promotion. Within the year, Bell’s depressing symptoms of fits and confusion would confine him to his home two doors south of his hotel. There, on Wednesday, Sept. 6, 1887, he died of what then was called “softening of the brain: dementia. Bell’s only son, Austin, then living In California rushed home to his father’s funeral and a Belltown inheritance that appeared much as it does in the above panorama (above the Bell home.). This 1887 (or perhaps 1888) subject looks north from near Second Avenue and Blanchard Street. That’s Blanchard at the lower right. .
William Bell’s hotel is the centerpiece of both this picture and the neighborhood, and his home is the house with the white picket fence and the cheery white smoke streaming to the east from its chimney. The intersection of Front Street (now First Avenue) and Bell Street is seen with a posing pedestrian standing at its northeast corner, center left. 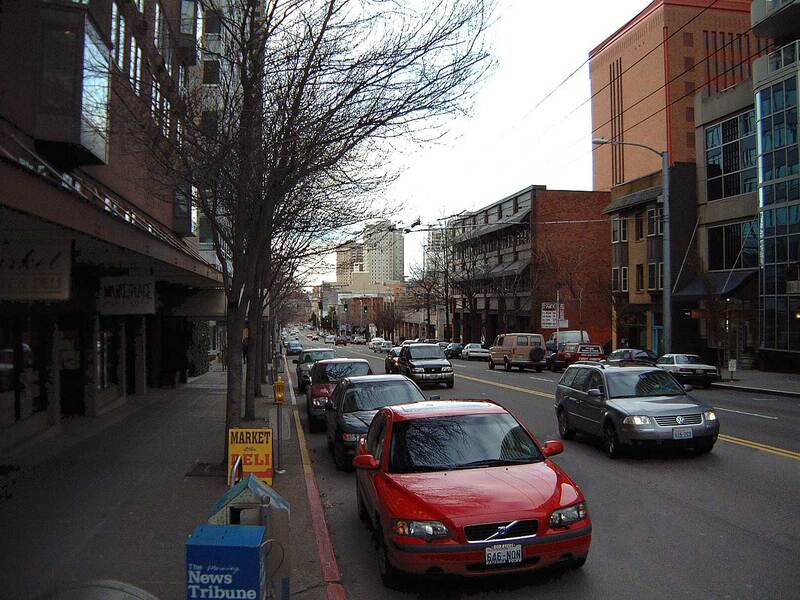 Front Street is lined with a few frontier facades and down its center runs the railway for the horse-drawn trolley, which in 1884 began its somewhat leisurely 17-block service between Battery and Mill (now Yesler Way) Streets. Belltown was first a forest into which William carved a small clearing for a garden and log cabin. There, Jan. 9, 1854, Austin Americus Bell was born. 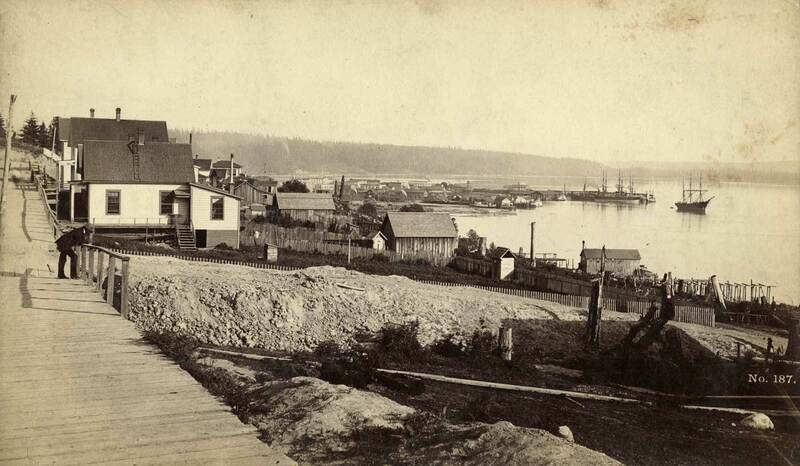 When the 1856 native attack on Seattle destroyed the first Bell home, William moved the family to California. At David Denny’s urging, he tentatively returned in the early 1860s to subdivide his claim, but not until the early 1870s did William Bell come home to stay. 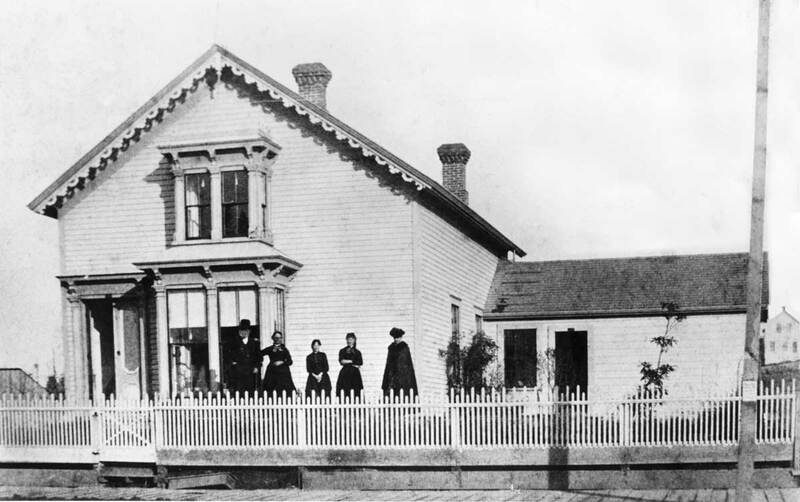 In 1875 the family moved back to Belltown and into the home with the picket fence. 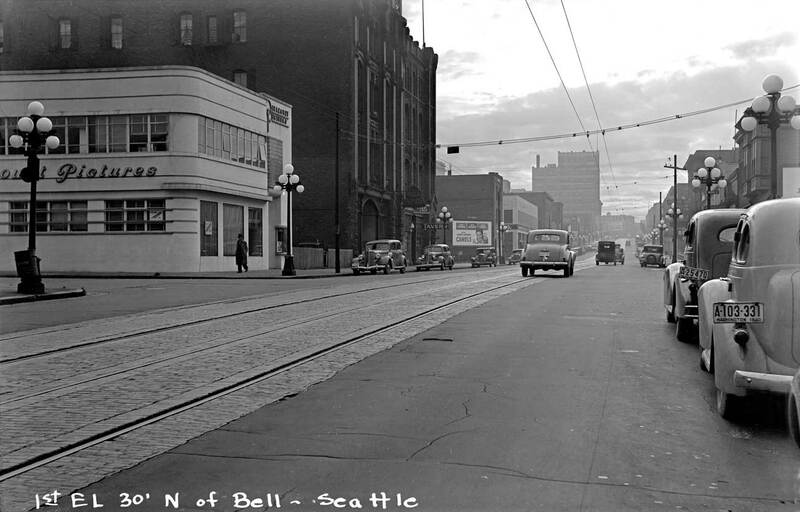 One year later, as a member of the City Council, Bell voted with the majority for Seattle’s first public-works ordinance, which paid for the regrading of Front Street from Mill to Pike Streets. When a boardwalk was added for the additional six blocks out to Belltown, this long and relatively mud-free walk became Seattle’s favorite Sunday and sunset promenade. For the decade preceding his father’s death, Austin Bell spent most of his time in California. 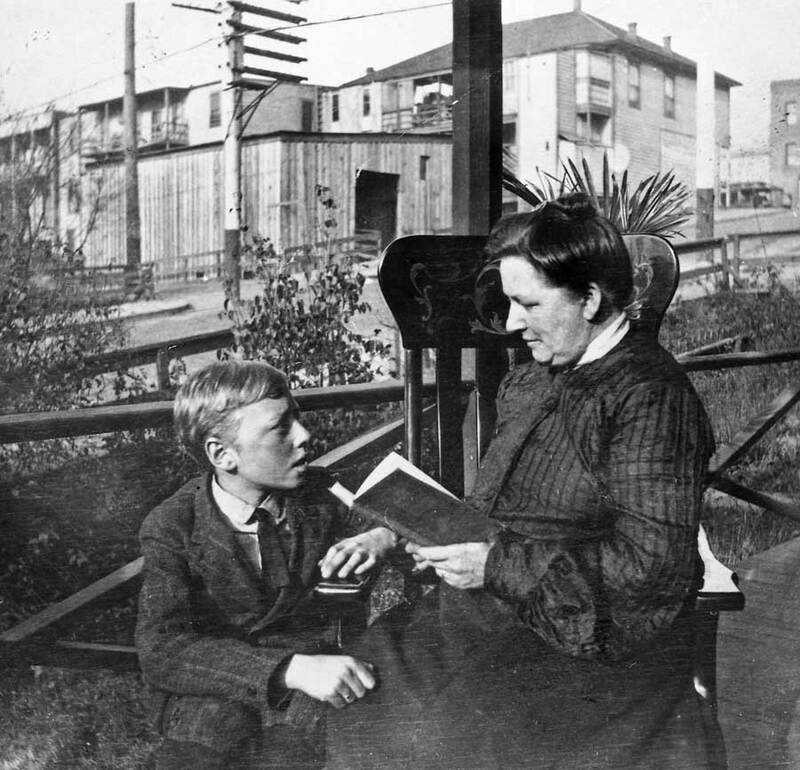 Returning in 1887, he and his wife, Eva moved into their home at Second and Blanchard (Just right and out of frame of our subject.) Now Austin began to act like a promoter, and by 1889 when he moved his offices to 2222 Front St. (Just left of our scene), he had more than doubled his inheritance to an estimated quarter million. A 1912 look northwest into Belltown from the southern summit of Denny Hill. Both the West Seattle and Magnolia peninsulas show their heads here. (Courtesy, MOHAI) DOUBLE-CLICK to Enlarge. On the afternoon of April 23 of that year he took a nephew for a buggyride through the streets of Belltown. Stopping on Front Street between his father’s old home and namesake hotel (the Bellevue House), he enthusiastically outlined with dancing hands the five-story heights to which his own planned monumental brick building would soon reach. That night Austin Bell slept fitfully but arose at 8 o’clock to a “hearty breakfast. '” At 9:30 he walked one block to his office, locked the door and, after writing an endearing but shaky note to his wife, shot himself through the head. He was dead at 35, his father’s age when he first carved a clearing in the forest that would be Belltown. 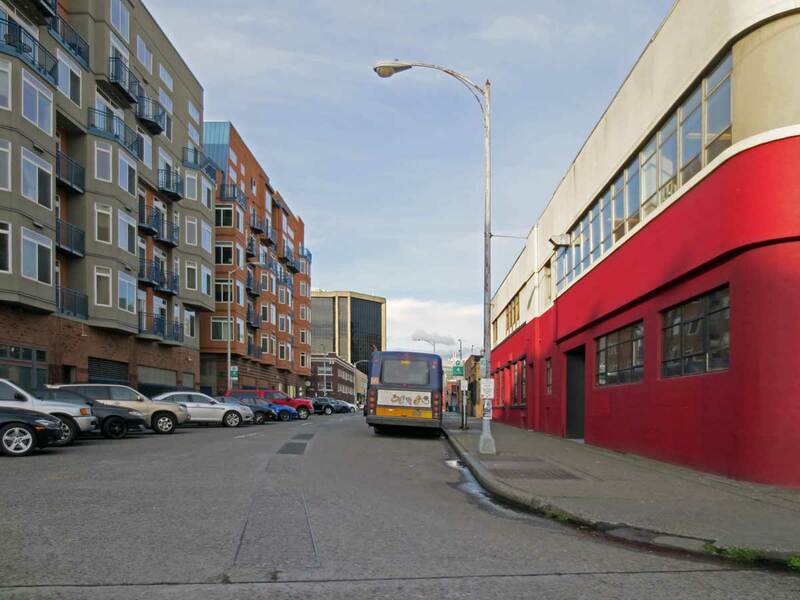 proposed new civic center in Belltown, prohibition and the Great Depression all conspired to keep Belltown more or less chronically depressed. Today the neighborhood is inflating with high-rises all much taller than five stories, but so far none of them quite monumental. However, now one also can choose a window seat in the Belltown Cafe, order an Austin A. Bell Salad and gaze across First Avenue to the depressingly empty but still grandly standing red brick Austin Americus Bell Building. The LEADER BUILDING, Across First Ave. from the Austin Bell Building. 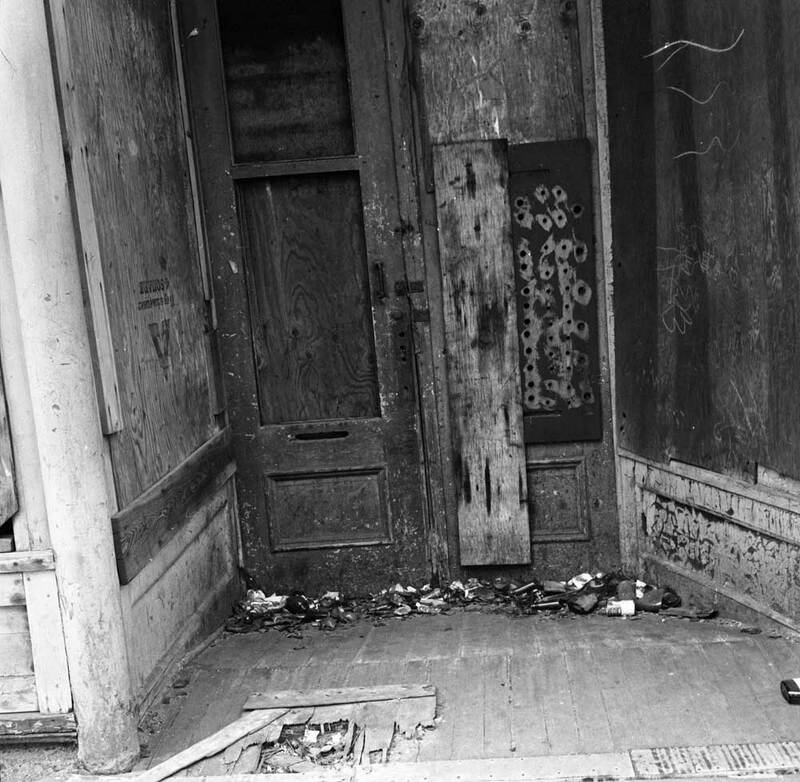 Frank Shaw’s March 13, 1976 record of the Leader Building’s front door. The Leader was built mid-block on the west side of First between Bell and Battery. It was early and made of bricks, which was rare. My own recording of the Leader – by coincidence. I date this ca. 1978. Does it seem later than Shaw’s subject? 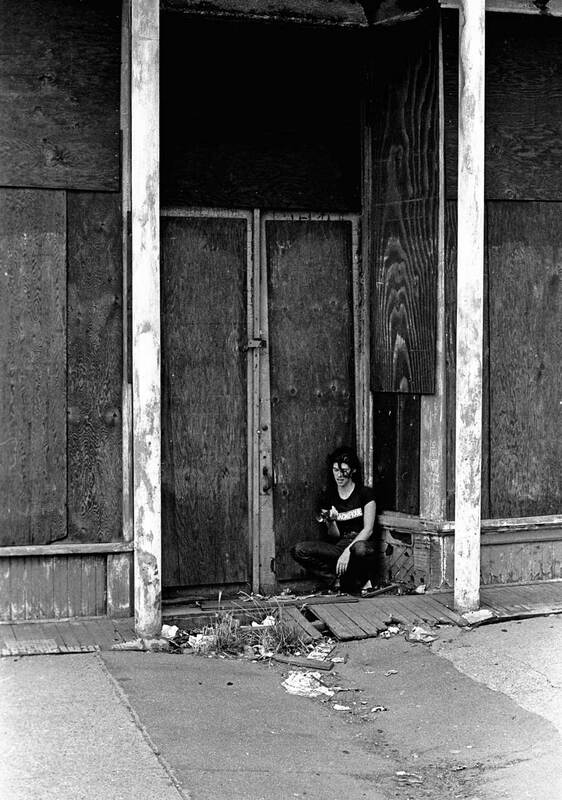 An old friend named Kathy poses at the door. 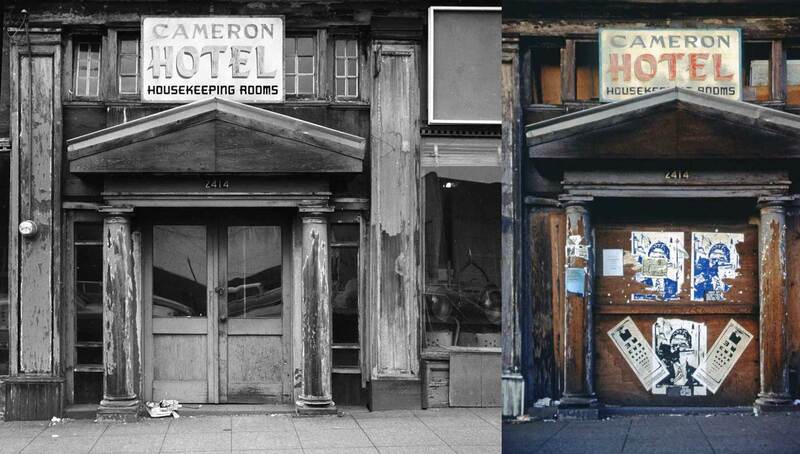 The CAMERON HOTEL by Frank Shaw, on the left, and by myself. 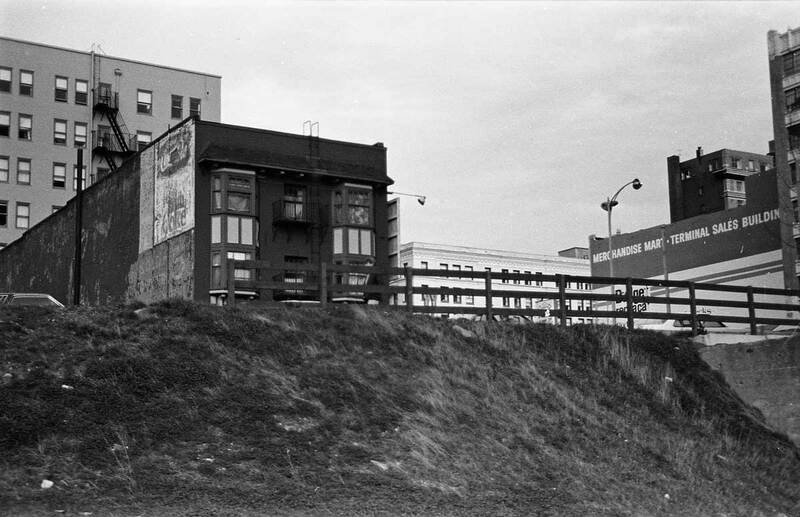 The Cameron was on the east side of First mid block between Battery and Wall Streets. Shaw’s subject is predictably dated in his notes, March 13, 1976. Mine is not, although with the windows gone and the door plastered with promotions, my color shot is certainly later, although not very much later. Someone will know how to date the posters, although that is soft-dating at best, for as you know in abandoned buildings like the Cameron pasted post-its can survive for years. 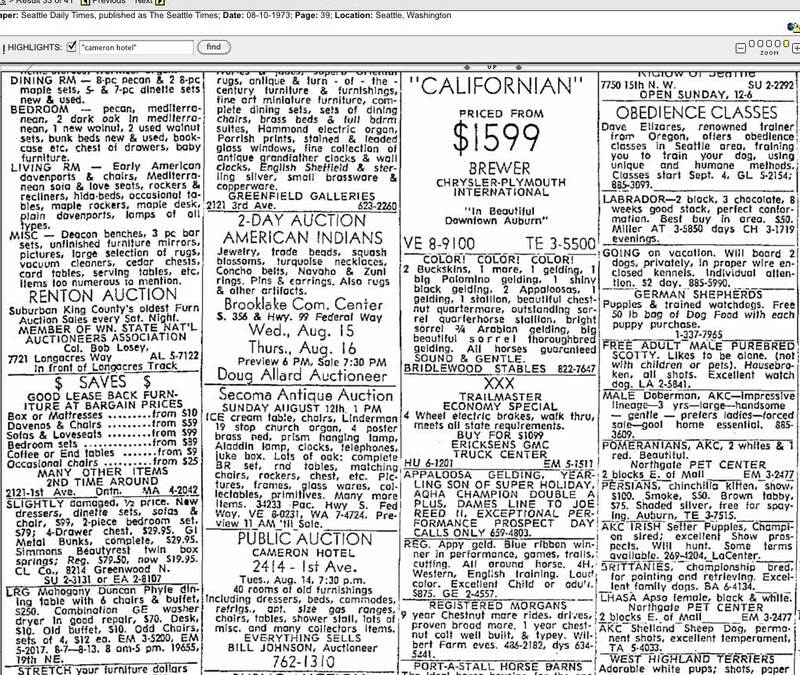 Include in this montage of classifieds from Aug. 10, 1973 is an announced public auction for everything in the Cameron Hotel. 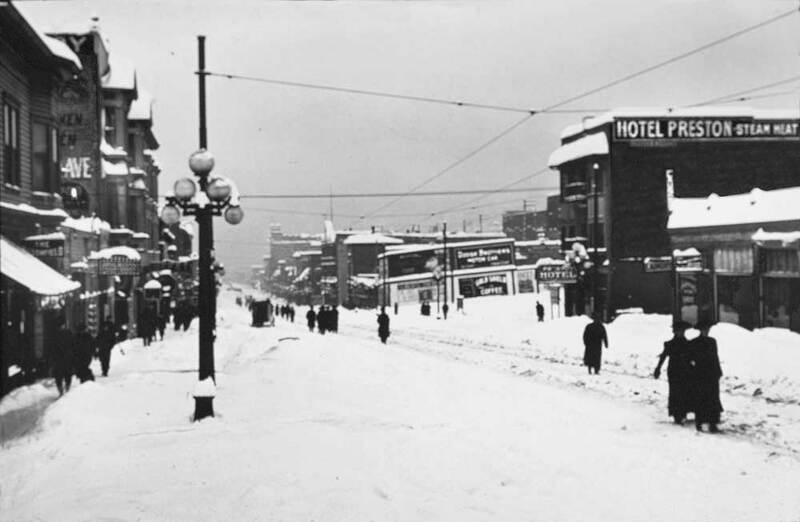 The HOTEL PRESTON, on the right, promises steam heat in this scene from Seattle’s Big Show of 1916 (For more on this the second biggest of our truly big snows see the “snow button” on the blog’s front page). The photographer looks north with her or his back to Virginia Street. My repeat of the snow scene above. Again I did not make dating this easy, although ultimately – by context – I can probably date nearly everything surface I’ve exposed. The Volvo model and its plates in front are inviting too. For now I’m speculating ca. 2000, and the Preston is still up although not a hotel. I found among my negatives two more of the Preston and both photographed by me from the west. For this one I climbed the bank some up from Western Ave. probably to get a better look at the Coke mural on the north facade. With window curtains, these apartments may still be in use. I date it ca. 1978. Here I peek at the Preston and the Westin Hotel too, from Western Ave. I date this ca.1981 largely on the evidence of the Westin work-in-progress. That is its larger northern tower near 5th and Virginia going up. Here the Preston seems vacant. PRES. 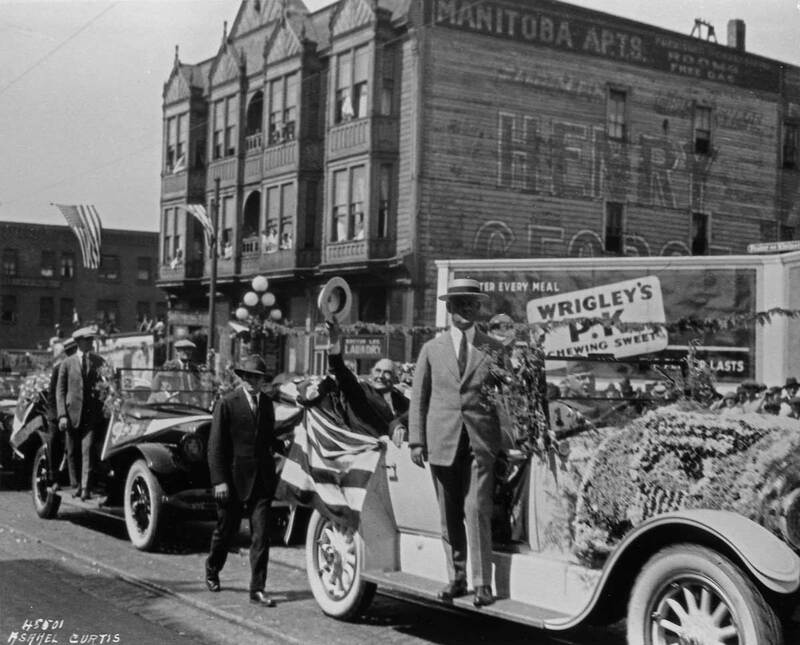 HARDING, JULY 27, 1923, MANITOBA HOTEL, 2124 FIRST AVE.
For reasons I have not searched, Pres. 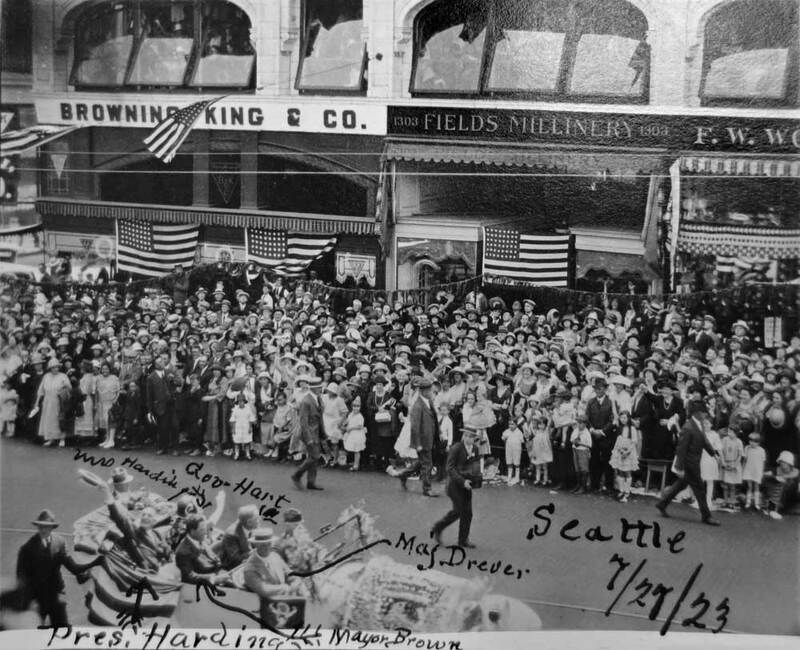 Warren Harding was paraded through Belltown during his brief – and nearly fatal – visit to Seattle on July 27, 1923. He saved the dying for his next stop: San Francisco, a city more deserving of a prexy’s passing. Here while waving his hat, he was still not feeling well. (The not very Secret Service riding beside and along could not save him. Behind him is the Manitobe Apts, a three-story Gothic frame with bay windows at the front that on cold nights – we imagine – might chatter like drunken residents drinking to keep warm. Asahel Curtis took this one – too. This Pacific feature first appears on April, 24, 1994. Earlier that parade day with Harding, Gov. Hart and Mayor Brown. Looking north on the center-line of a quiet First Ave with the Manitoba Apartments on the right, at 2124 First Ave., closer to Blanchard than Lenora. Note the landmark tower of the Austin Bell Building down the way. Rowe’s row is at the center. 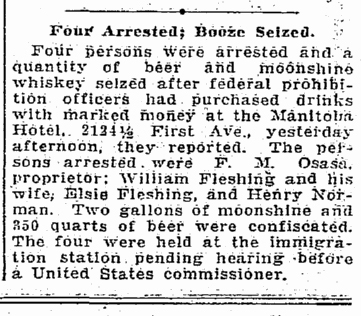 A Seattle Times clip on Moonshine over Manitoba during the year of Prexy Harding’s pass-by. The clip is dated Oct. 14, 1923. 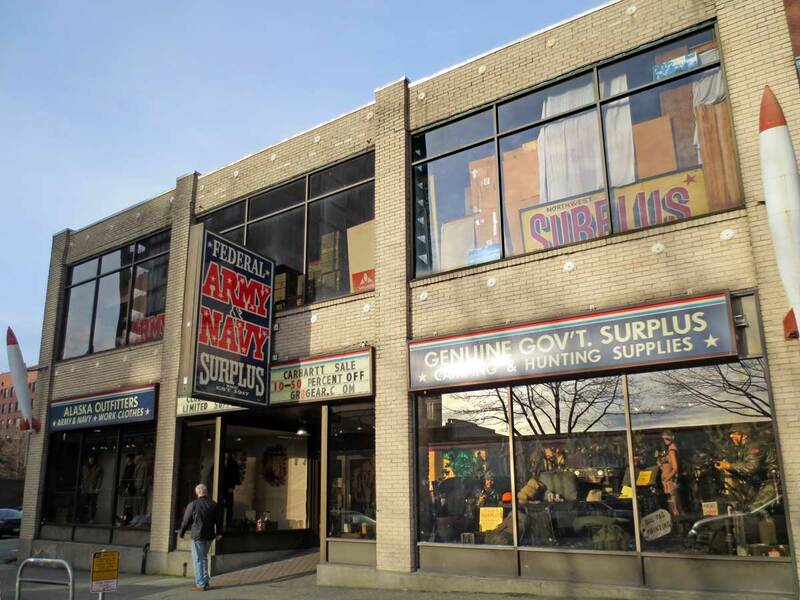 Nearby but later, the Federal Army & Navy Surplus at 2112 First Avenue. Surviving like the Pilot fish, hanging around sharks and the big cargo ships of the Military-Industrial Complex. I bought my rubber boots there. Taken from the back of the Bell Hotel most likely in 1887 or 1888. This pan was wide enough that it required two features in Pacific to include it all. The book version is printed directly below. Keep CLICKING to Enlarge – to read. Or find the entire book under this blog’s books-button. 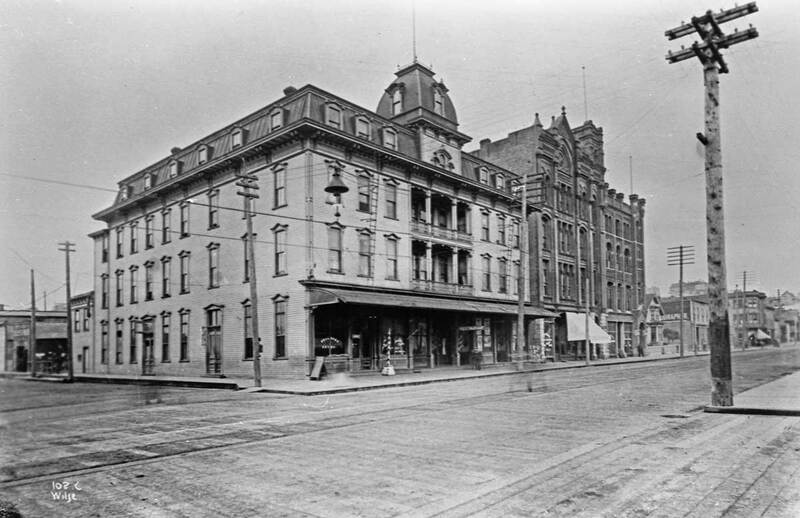 The Bell Hotel, at the southeast corner of First Ave. and Battery Street, with the Austin Bell Building beyond it. This photo, by Anders Wilse, dates from circa 1898. Battery Street looking east from First Ave. Although I took this photo I now have no feeling for how long ago Perhaps the autos have their hints and the condo too. What runs beneath Battery revealed. South on First towards Battery. This I manage to date from May 1995. It was taken, I think, when I was help Walt Crowley produce his Historic Trust Guide to Seattle. The next view from 1940 looks thru the same intersection. A subject chosen by the Foster and Kleiser billboard proliferators and signed in code. The caption at the bottom refers to the billboard barely seen here one block south on the east side of First, short of Bell Street. The date is Sept. 24, 1940. This was then still part of “film row.” Note the occupant of the deco business block left-of-center at the forer site of the old Bell Hotel. A clip from June 25, 1926. It may be the P-I. 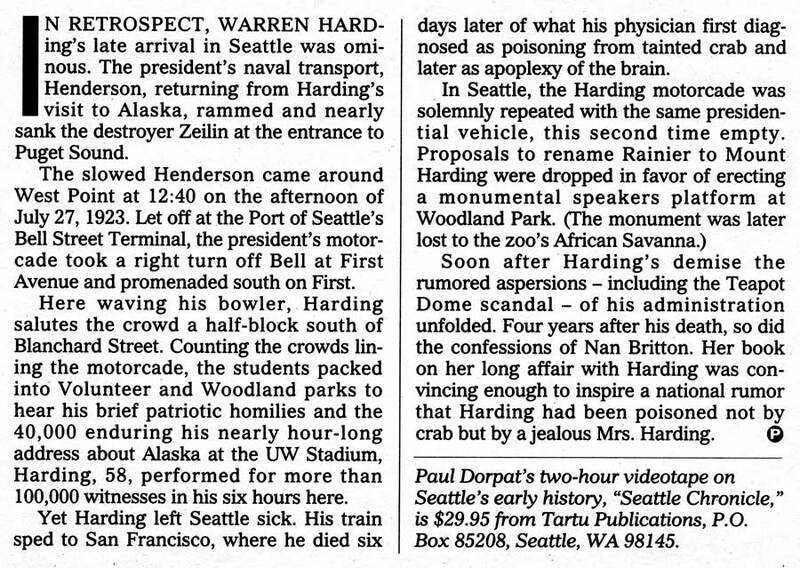 From The Seattle Times, June, 27, 1926. 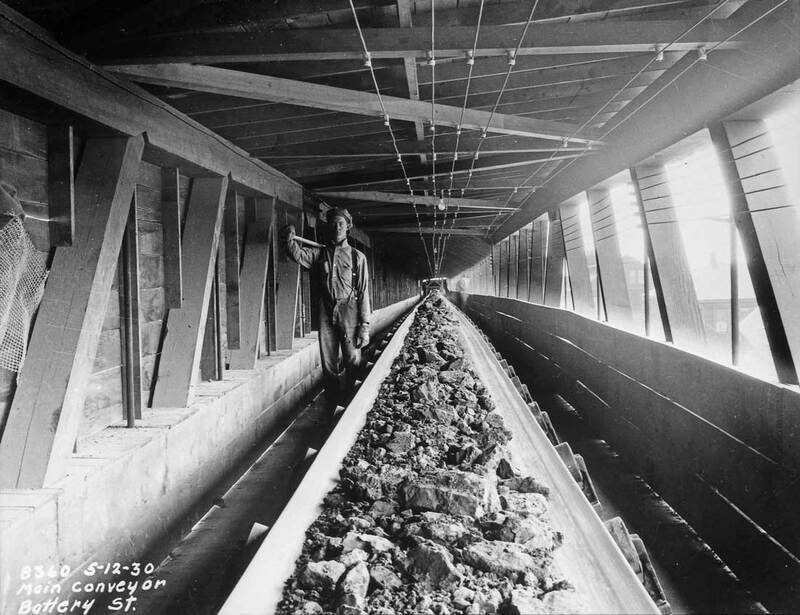 Before the widening and long before the viaduct and its tunnel, came the Battery Street conveyor belt which moved the last of Denny Hill to the Battery Street waterfront for dumping – by self-righting barges – into Elliott Bay. Some of the character of this comer has also held. 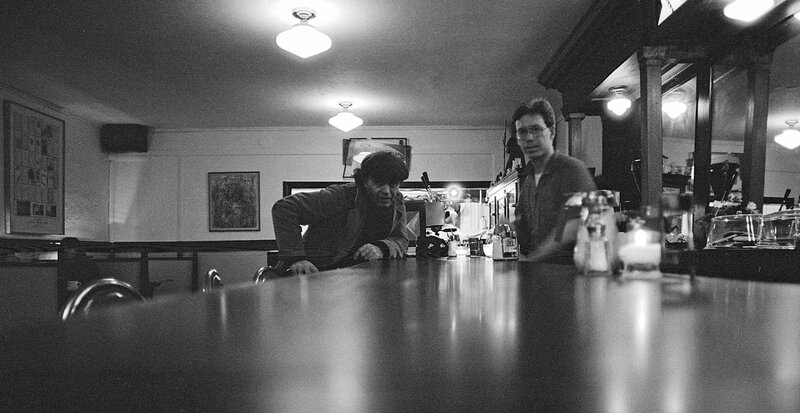 Until it closed three years ago [in 1987] the Queen City Tavern was, according to the contemporary Martin Paup, the longest continuously operating union bar in the city. Consequently, that watering hole shows up in the older view as does the historical Martin Paup posing with his wife Ellen and their three children to the right of the sign reading “General Store.” Paup is the one with the mustache, but without the hat. By the time this Martin Paup died here in 1938 he’d become a cherished pioneer. Born in 1846 to poverty and as a child indentured by his parents to an abusive farmer, he eventually escaped to the Civil War as a boy cavalryman for the Union side. Years later, as old as 86, he marched the entire route in local parades as color bearer for the remaining Civil War veterans. The still young Paup came west after the war and soon settled on Bainbridge Island, working for many years as an engineer for the Port Blakely Mill Company on the famous pioneer steamer Politofsky. 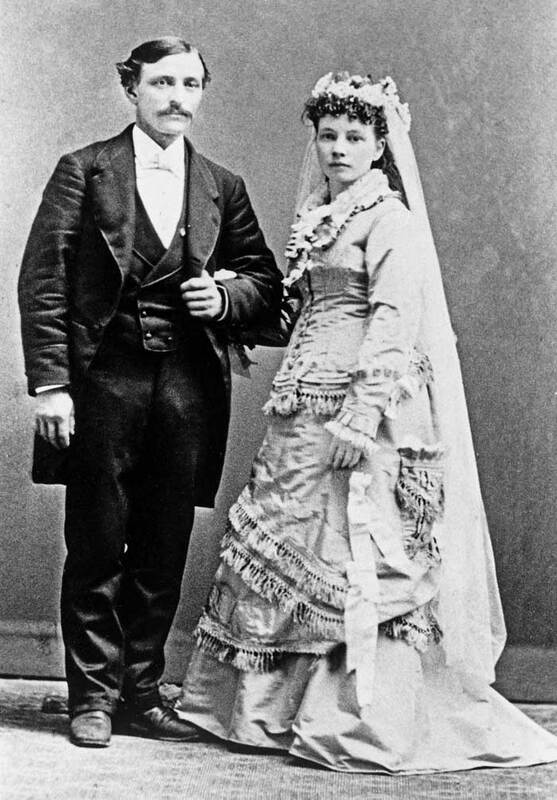 Married in 1877, Ellen and Martin began to raise a family and save their money, investing it in real estate and rental homes mostly in Belltown. Posing with a book on the front porch of the Paup home at the southwest corner of Western Ave. and Blanchard Street. 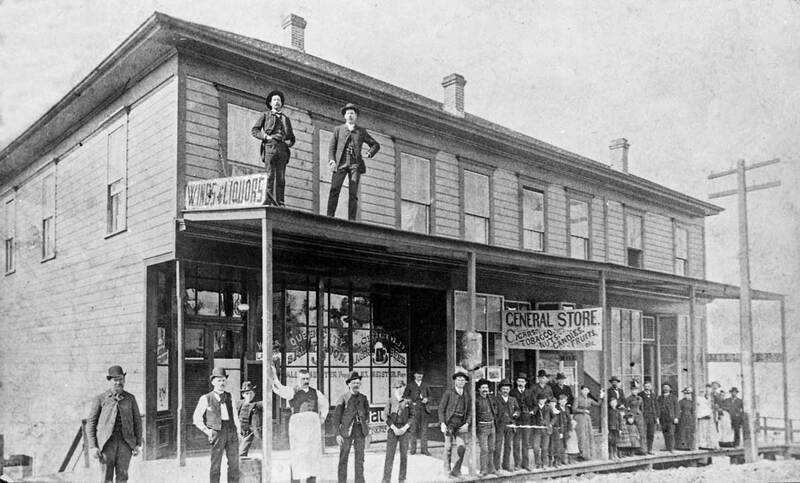 And so he did, moving with his family to Belltown in 1895 to a home at Western Avenue and Blanchard Street, one block west of where Ellen and he soon built this two-story commercial building with the tavern, a general store, bakery and modest hotel upstairs for “traveling men” (two of whom may be posing on the roof). Scanned from the Times clipping, the corner now, or rather in 1987. When this short-lived clapboard was razed in 1910 for the brick property in the “now,”  its basic commercial uses as a bar downstairs and a hotel upstairs were retained. And in this there is yet another continuity, for the contemporary Martin Paup (grandson of the Civil War veteran) has, with the help of the city, renovated the old Lewiston Hotel to retain its service to low-and-fixed-income tenants. The average rent for the Lewiston’s 48 units is only $113 a month . 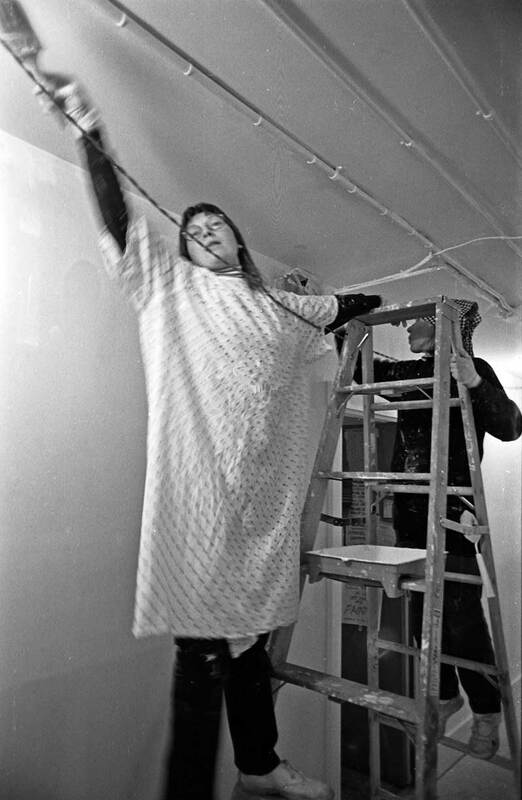 When this good work was done in 1980 it was the nation’s first federally-supported SRO (Single Room Occupancy) project. Today the Lewiston is managed for Paup by the nonprofit Plymouth Housing, an agency of Plymouth Congregational Church, an institution with a long record of inner-city social activism. 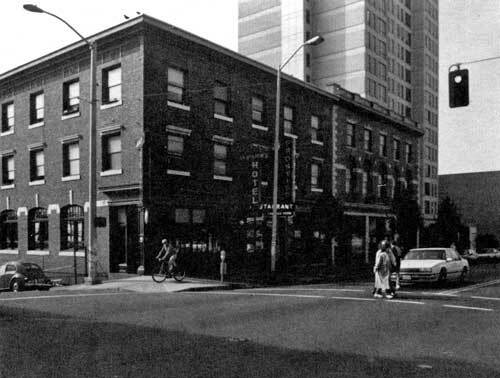 In 1987 the comer regained its Queen City name when Peter Lamb, owner of the Pike Place Market’s popular II Bistro restaurant, opened the Queen City Grill here, next door to the Frontier restaurant and cocktail lounge. This neighborhood is the destination of my own history search. As a fan of Almost Live, I wondered the location of the Lame List. This feature has the same clips of long-haired rockers saying “Lame!” to various categories that an off-screen announcer mentions. It takes place in what looks like an information kiosk filled with band posters in front of an old building, probably Pioneer Square. 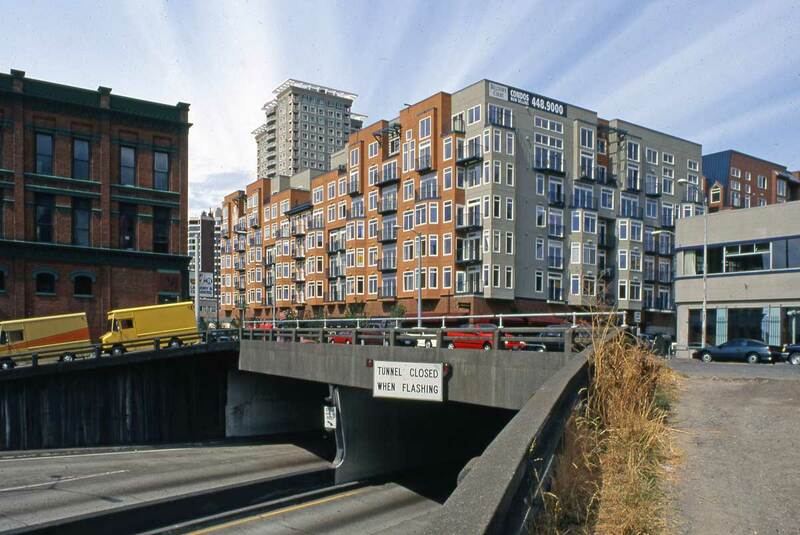 It wasn’t until I saw a different sketch on the show, “The Last Northwesterner,” that they showed the Lame List site again, and then panned around to show the west portal of the Battery Street Tunnel. Now I knew where it was, and I had walked by it not a few months ago and not recognized it. I went to Street View, and found the boarded up door now leads to a Starbucks in the Austin Bell Building. I don’t know if I would have been able to spot this location without the help of the other sketch.